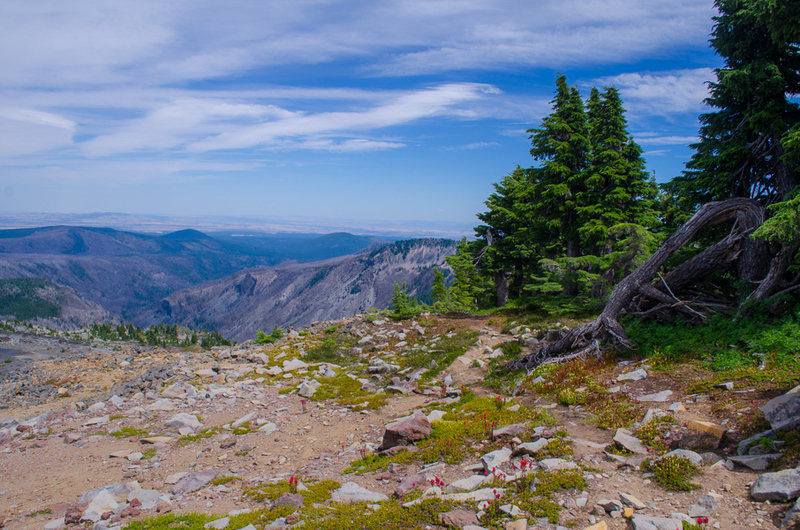 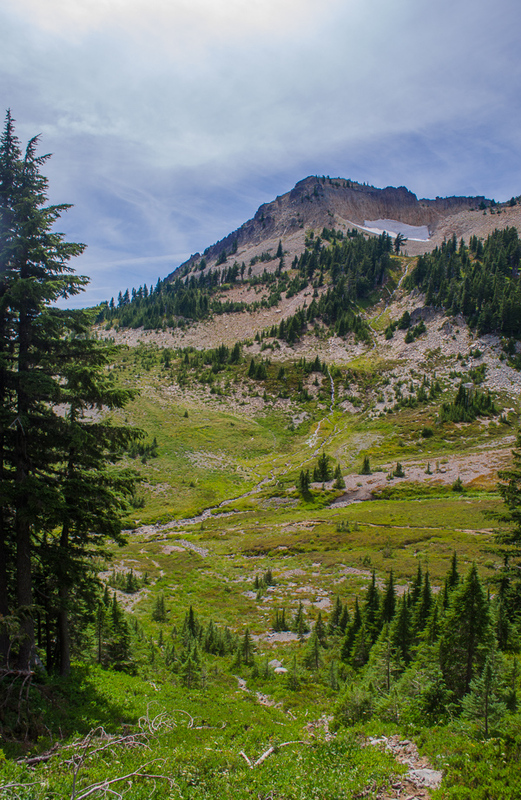 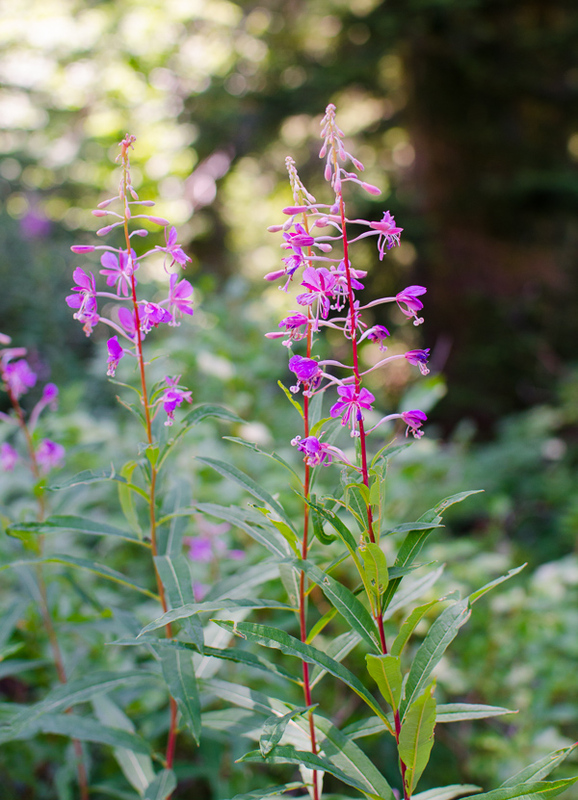 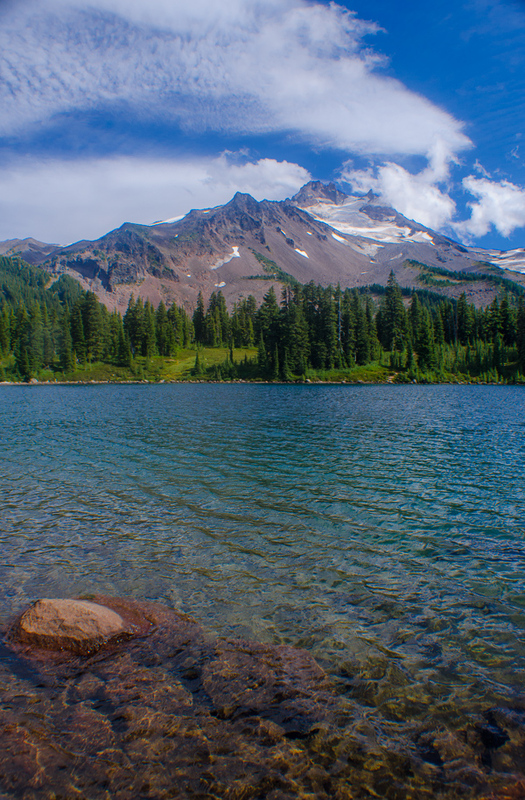 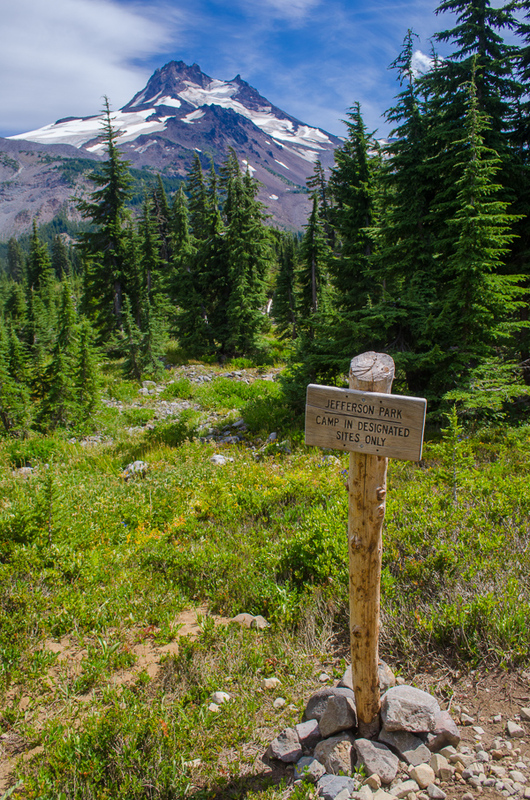 Another hike that we crossed off our summer bucket list recently was Jefferson Park. 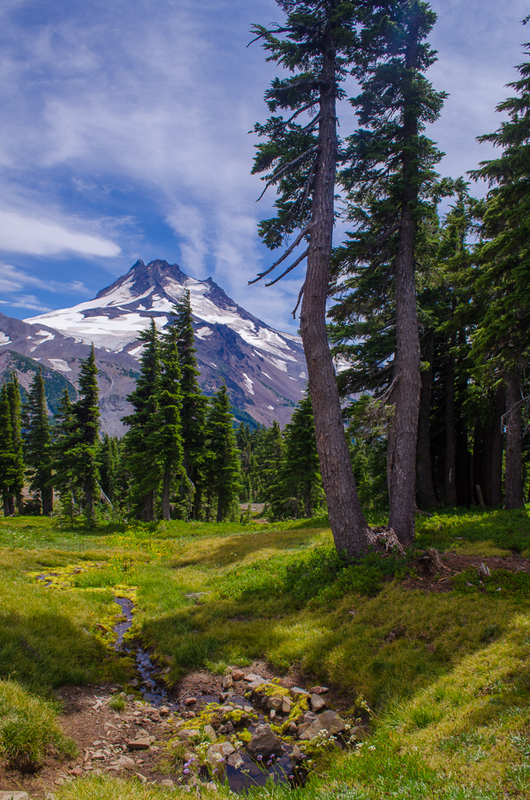 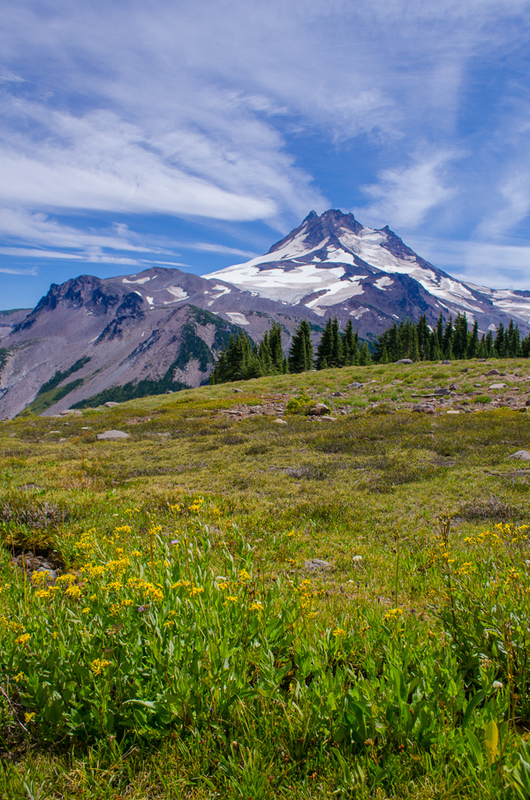 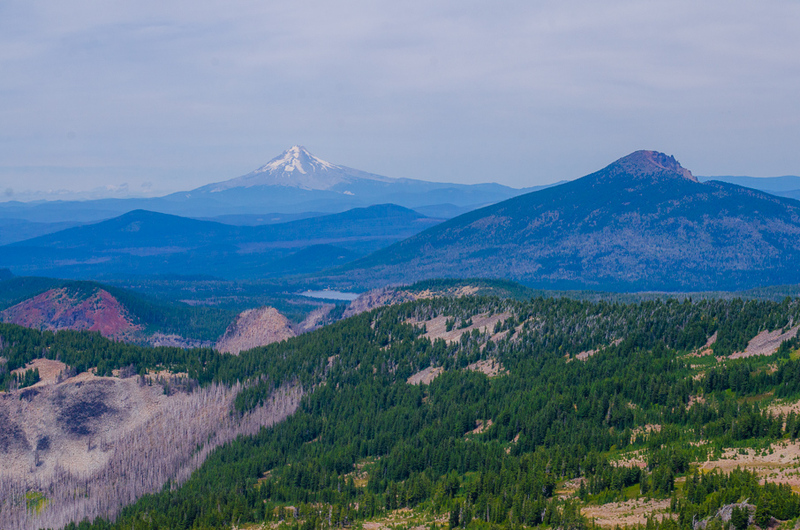 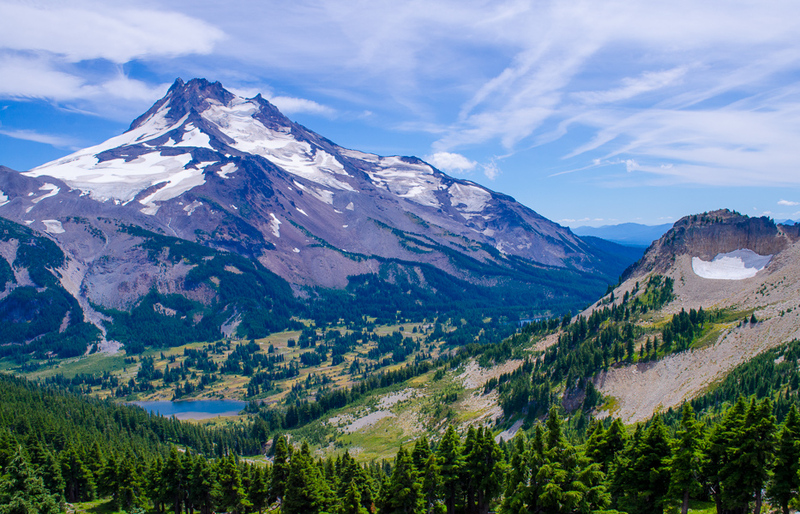 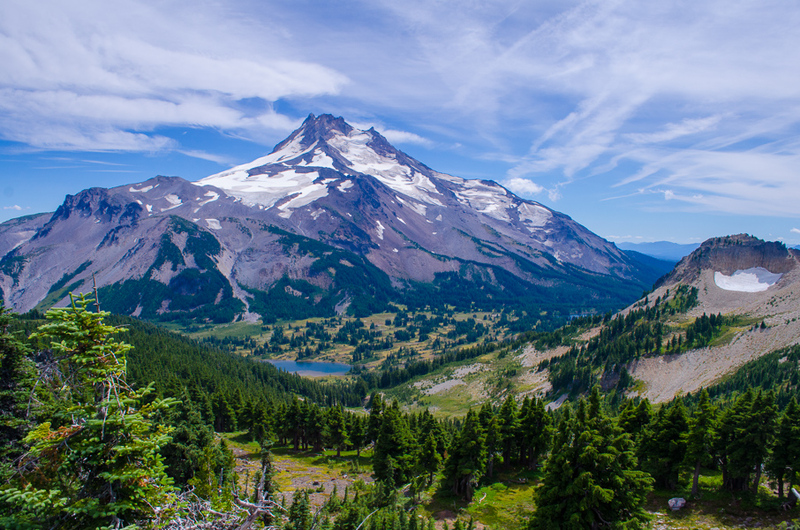 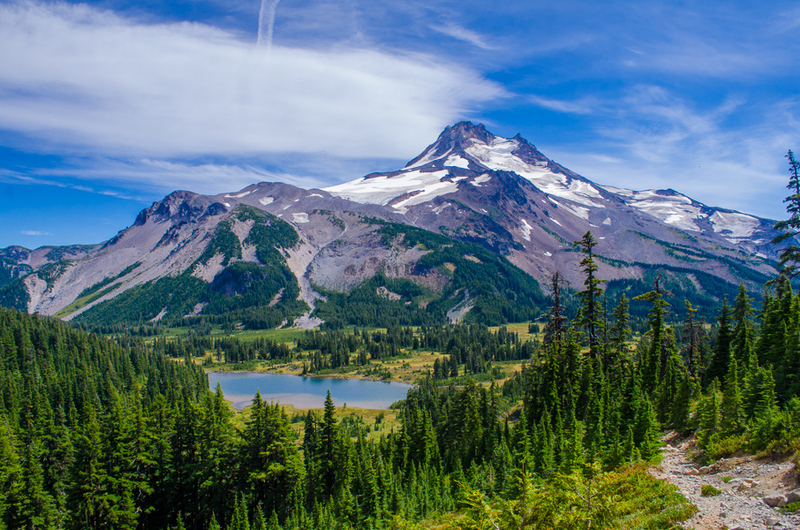 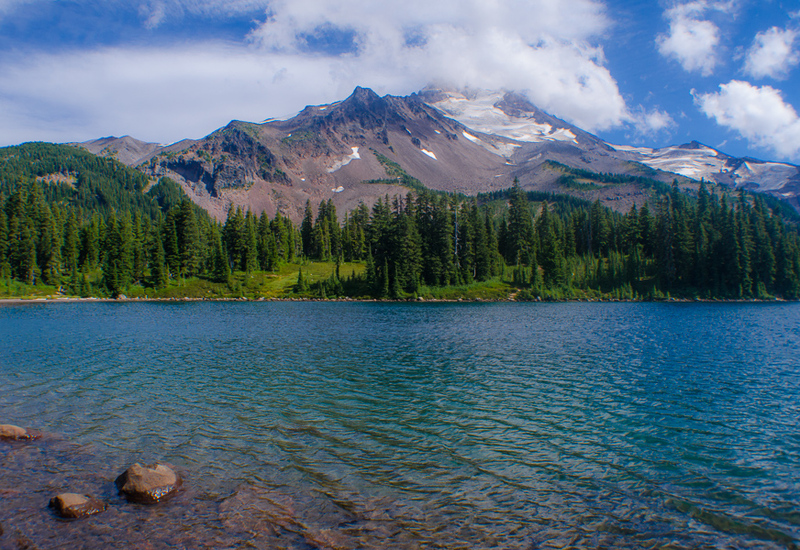 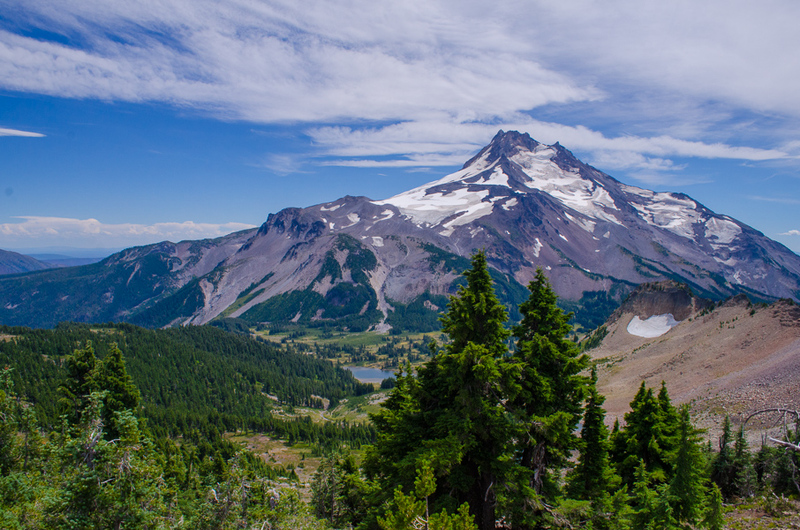 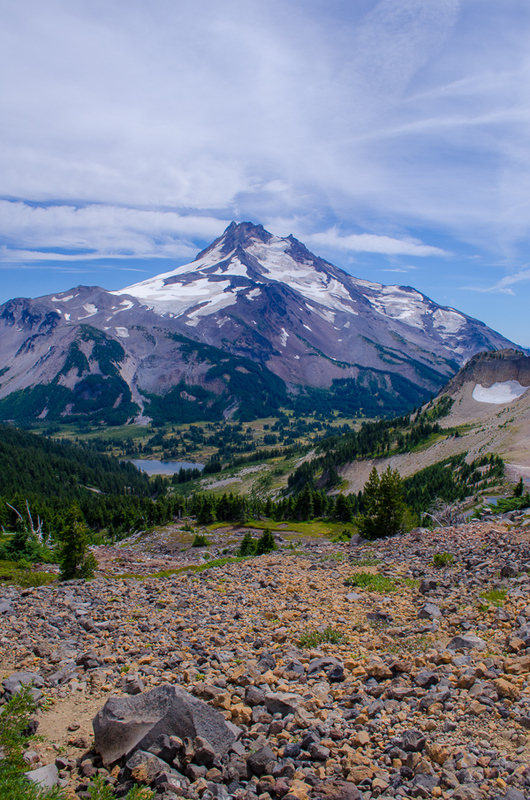 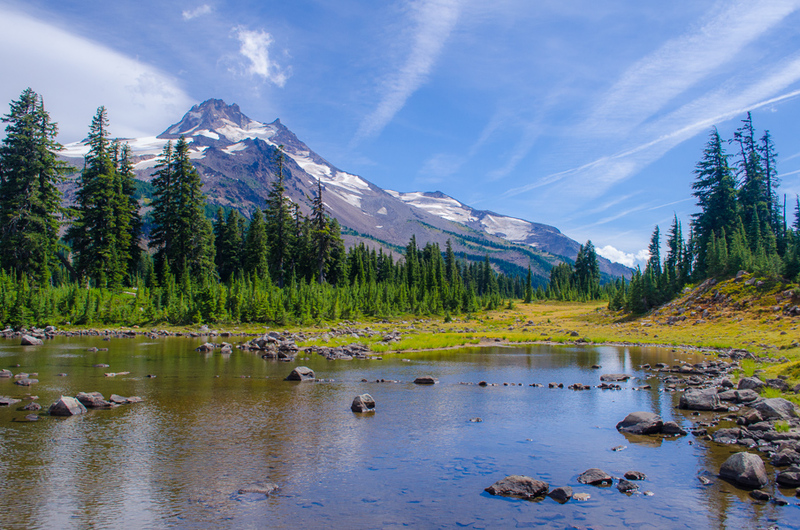 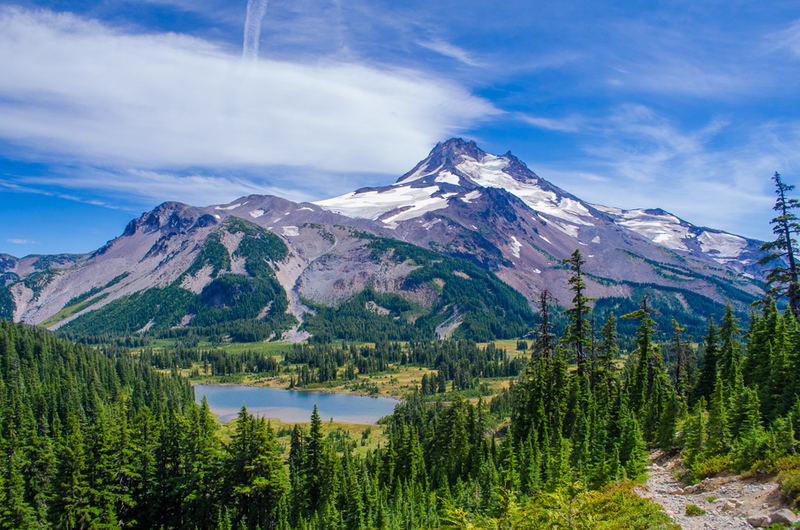 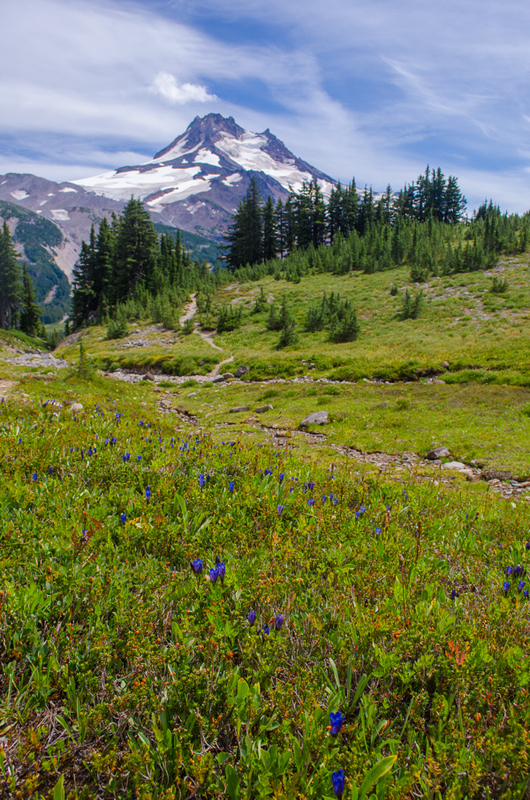 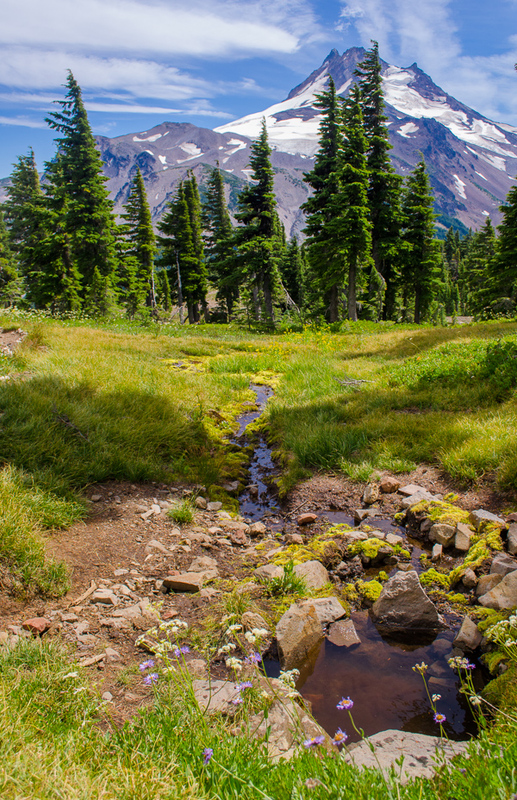 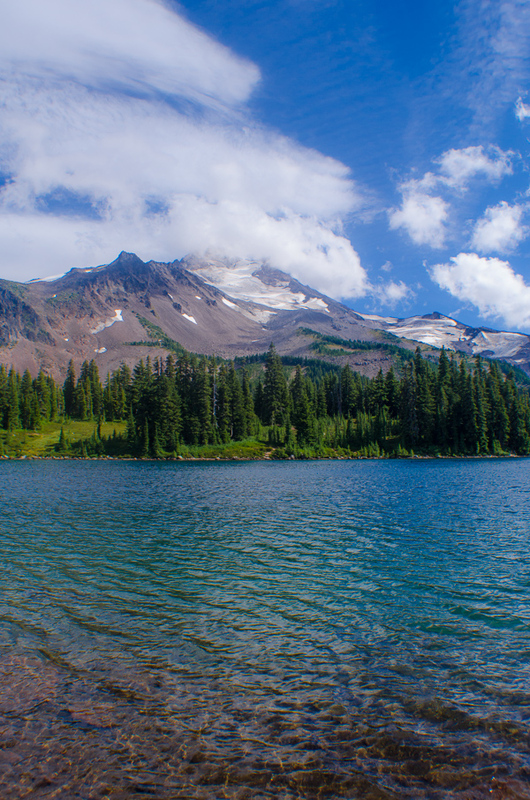 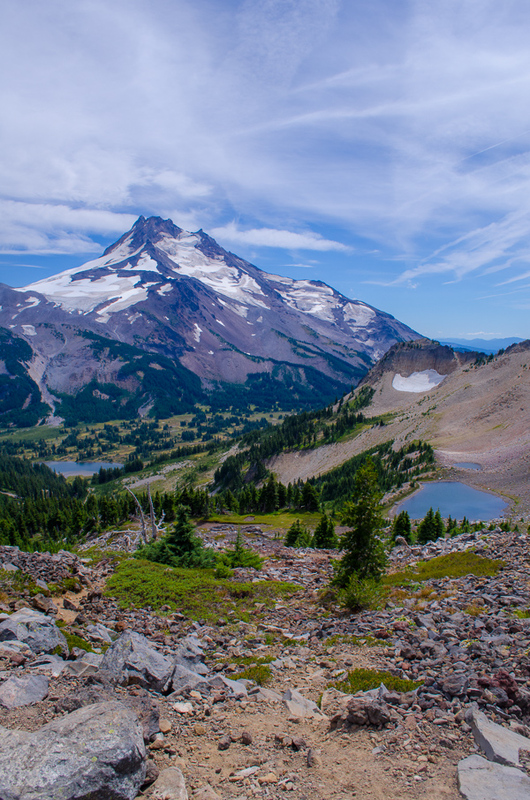 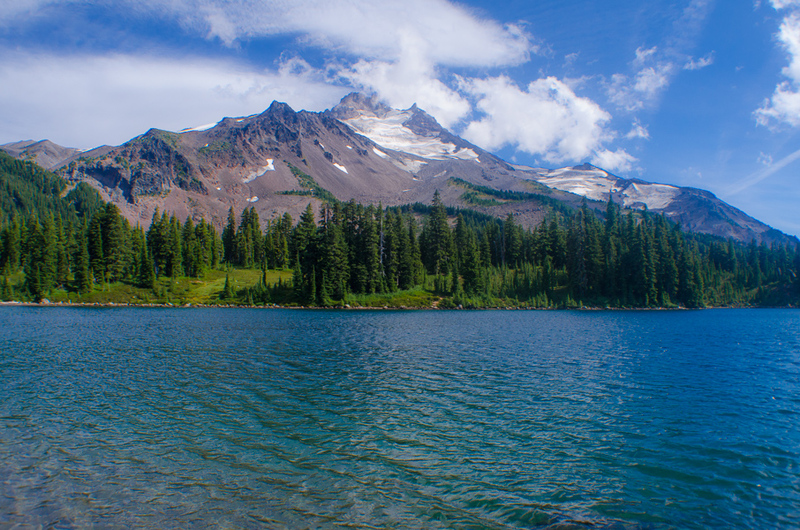 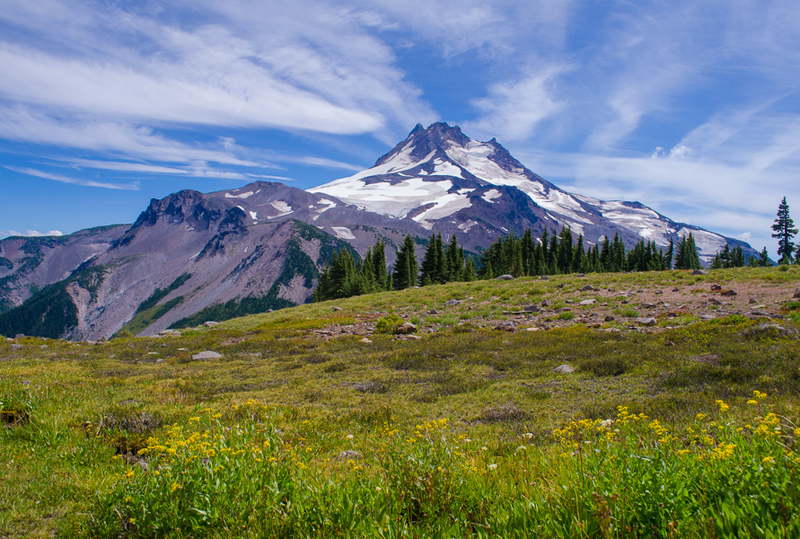 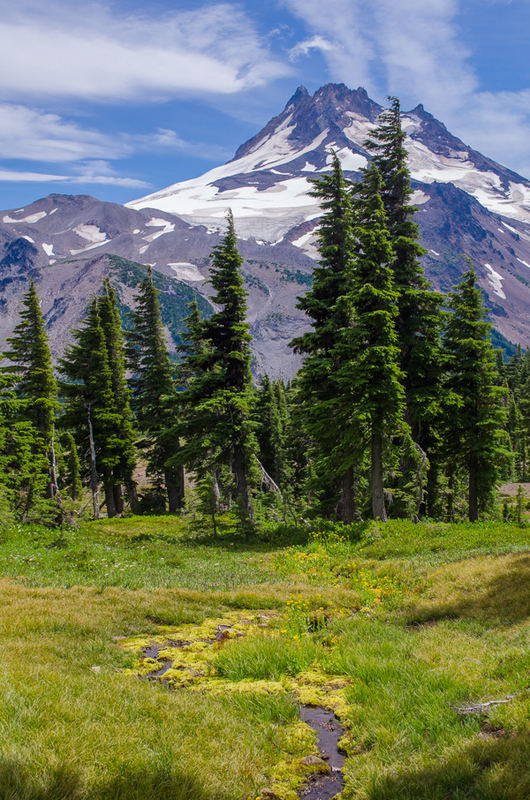 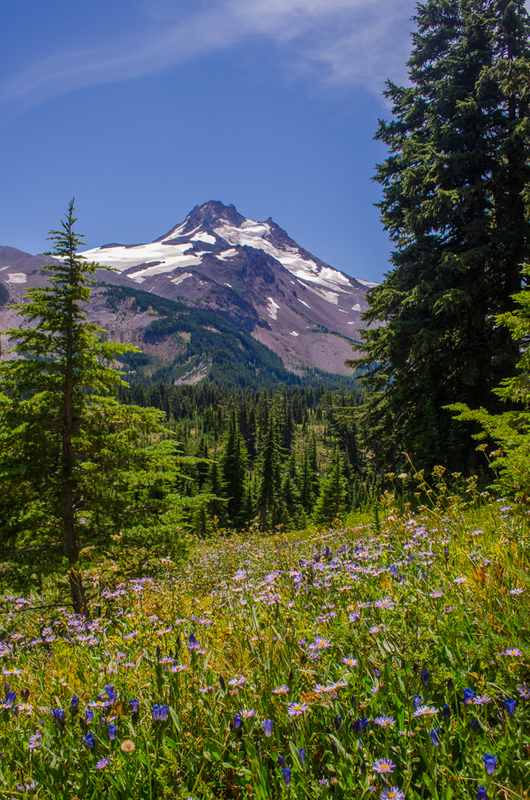 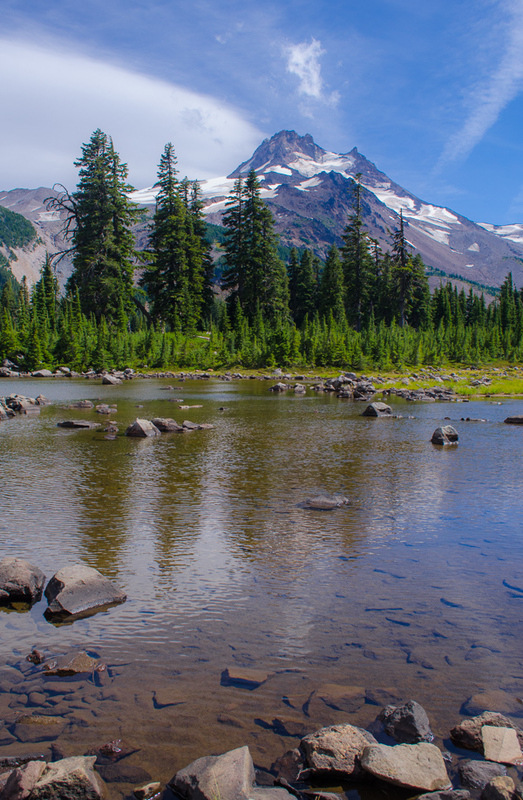 This beautiful locale features wildflower meadows, lakes and scenic views of Mount Jefferson … but there’s no easy way to get to it. 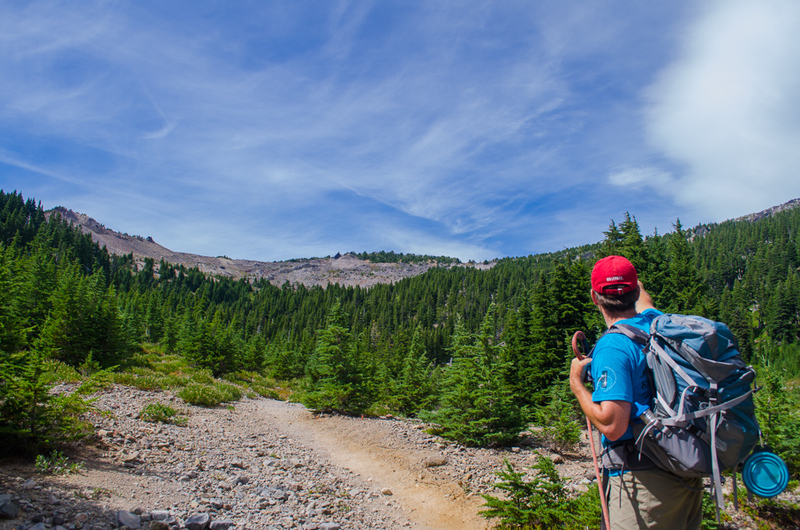 No matter what, you’re hiking a long hike. 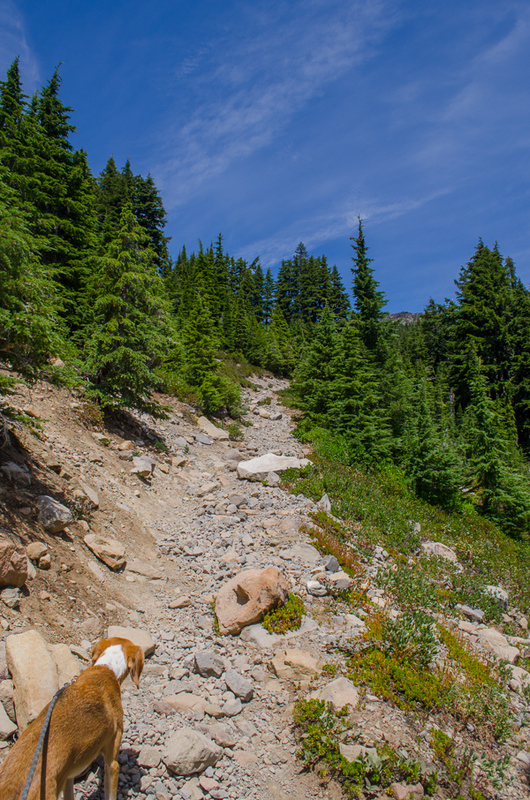 Our chosen route departed from Whitewater Trailhead which starts off with an upward climb. 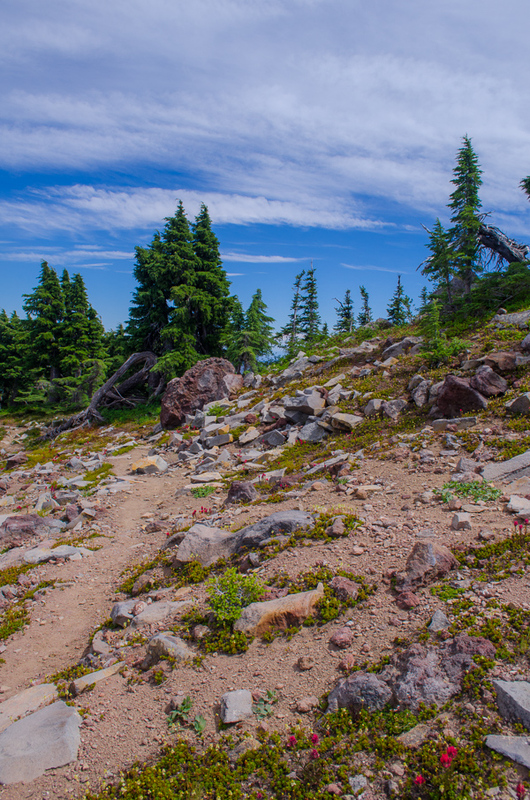 The trail then travels across a ridgeline with a creek crossing here and there until eventually opening into Jefferson Park. 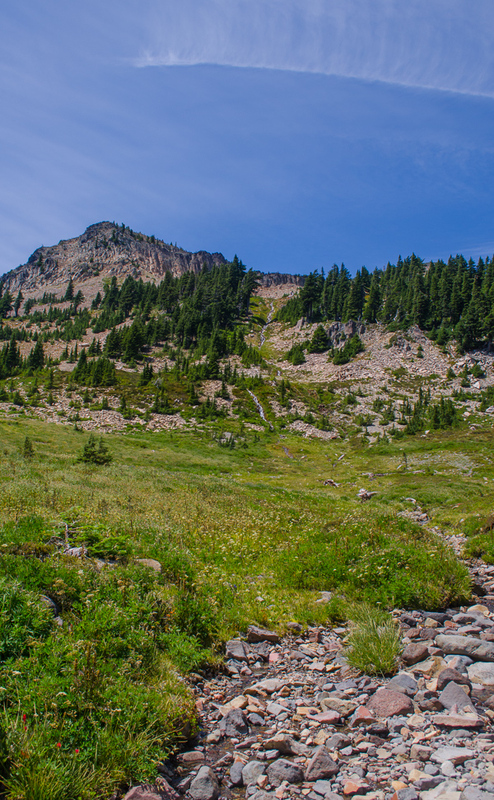 This particular hike is about 12 miles long but being that we’re gluttons for punishment, or rather gorgeous views, we tacked on an upward hike to Park Ridge, bringing our grand total for the day to about 16 miles, our longest hike thus far. 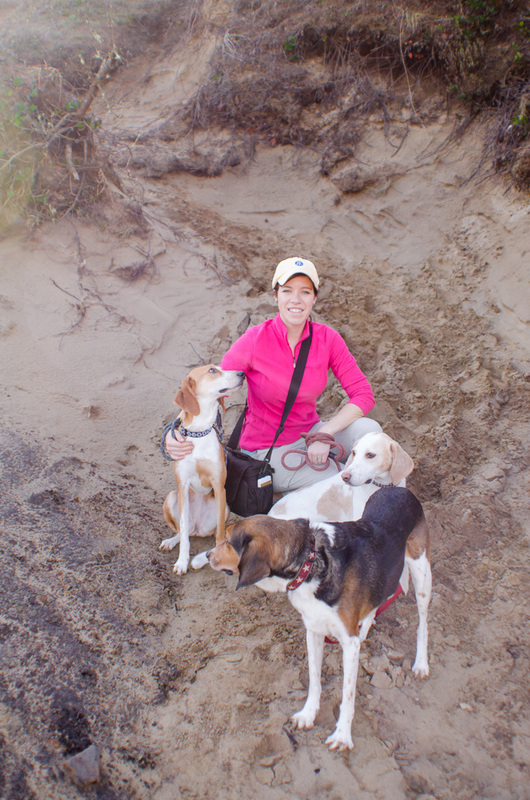 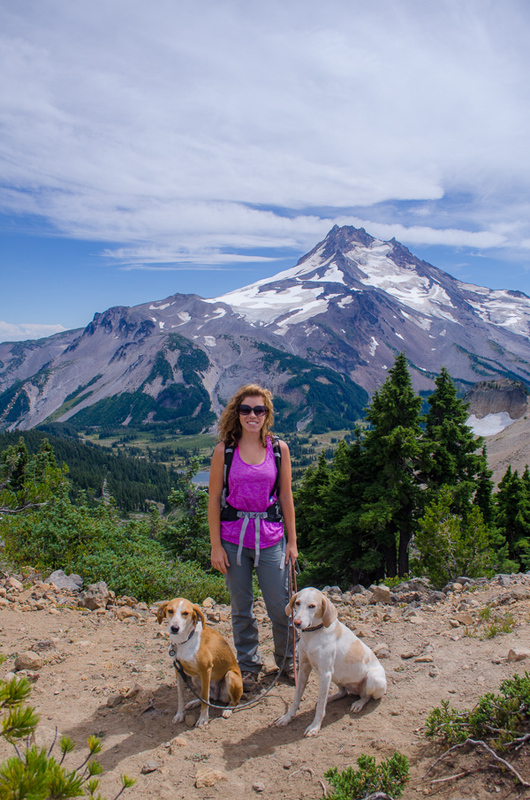 Fortunately, the fact that we (and the dogs) hike pretty much every weekend prepared us quite well. 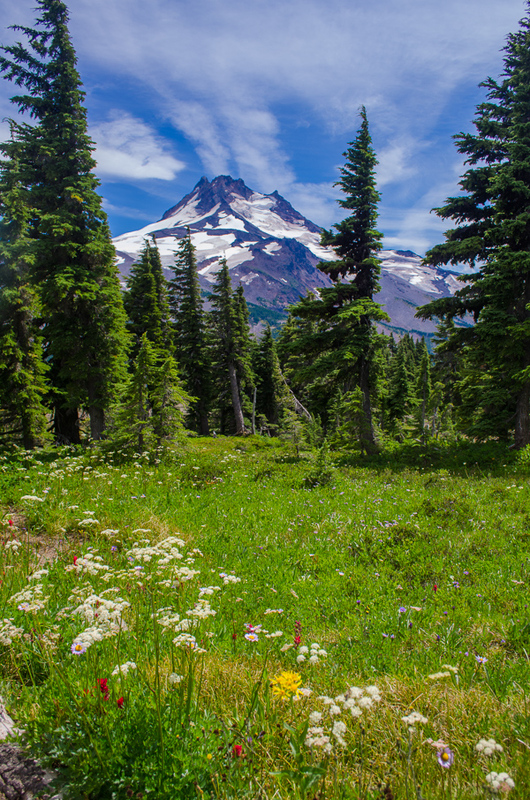 Jefferson Park is, in a word, magical. 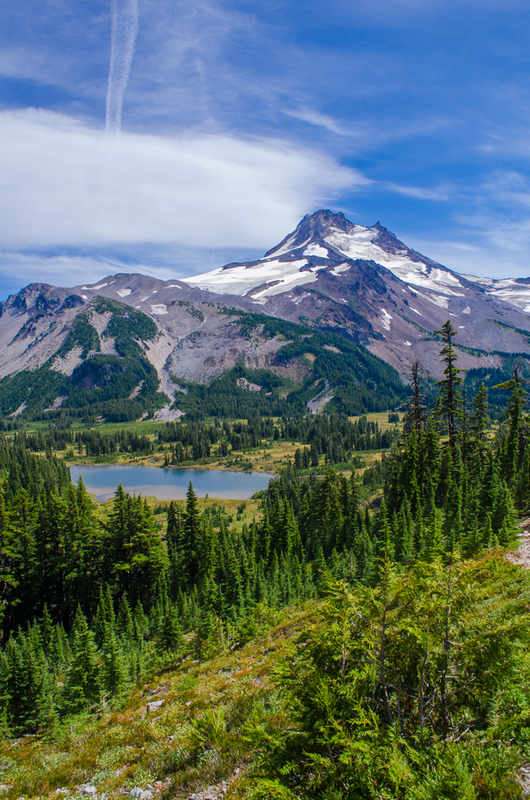 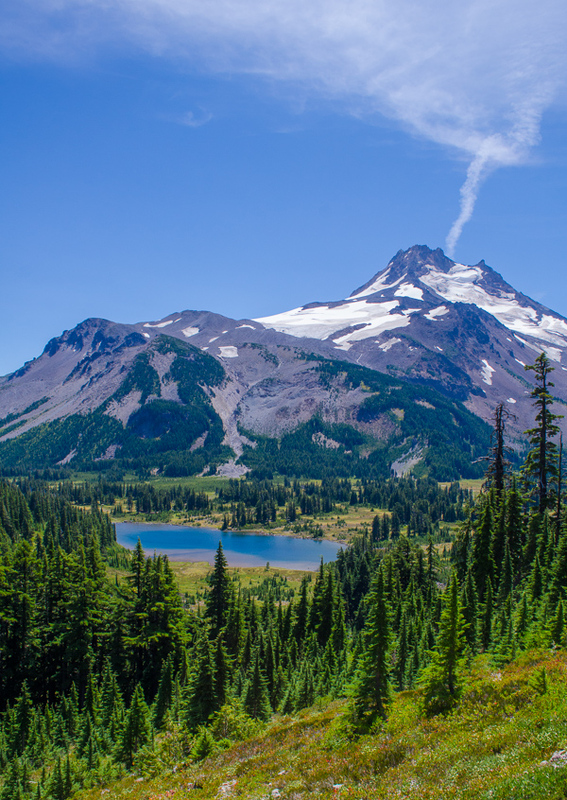 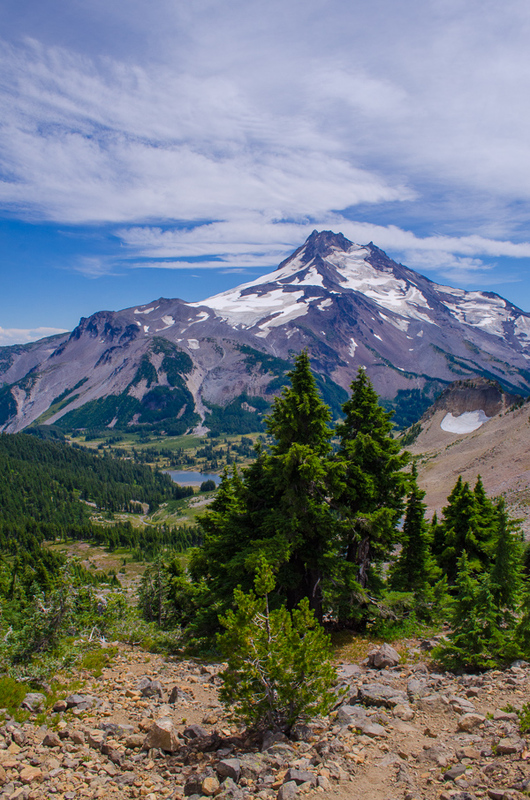 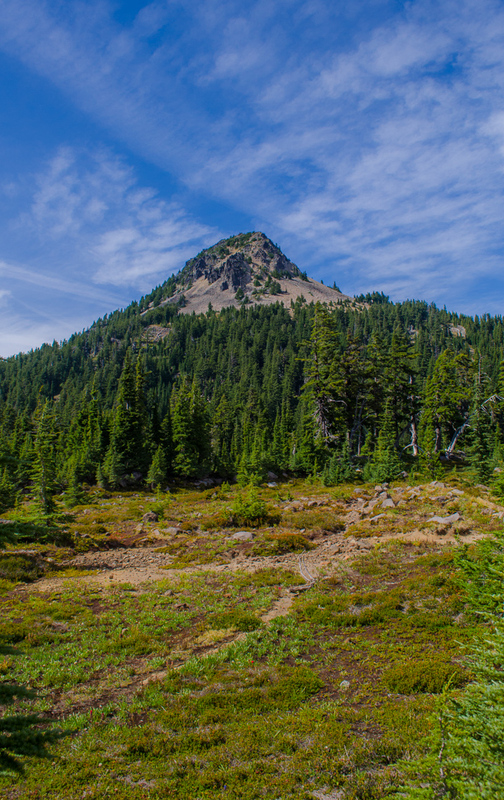 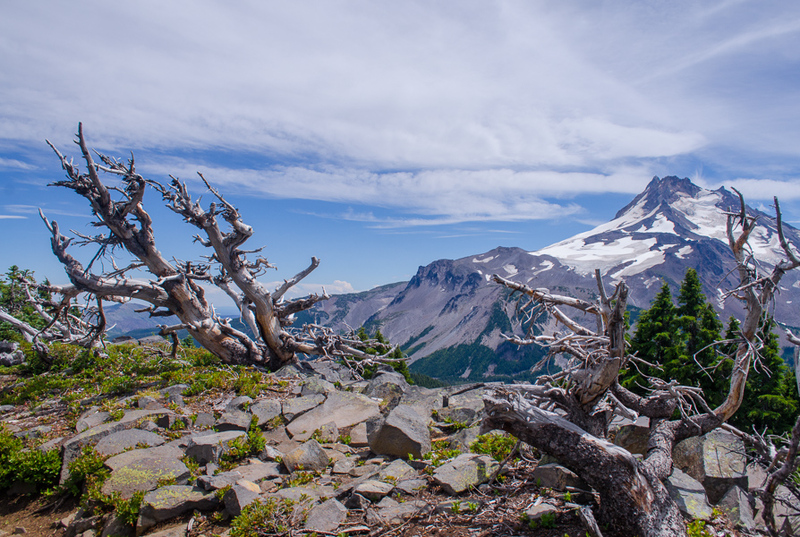 Mount Jefferson is seemingly everywhere – you feel so close you could hug it. 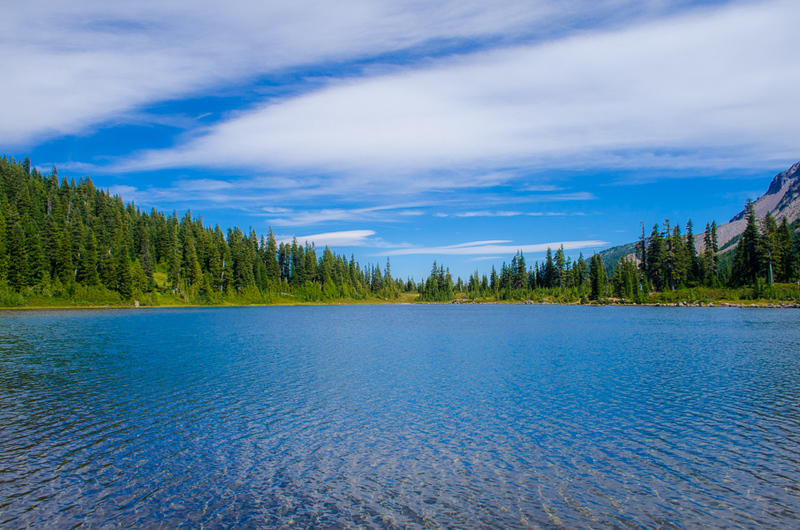 Various lakes reflect its beauty in their clear waters and a pervading peace is all around. 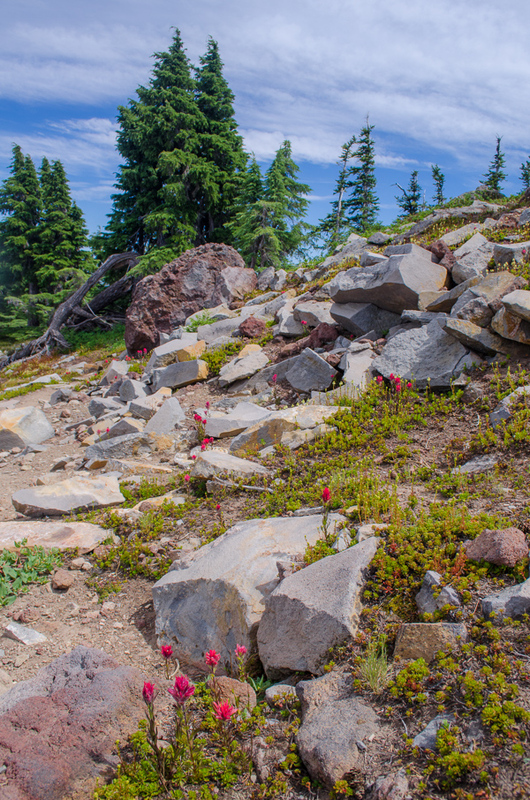 We were tempted to stop and rest as soon as we entered the park but we decided to get the remainder of our uphill climb out of the way. 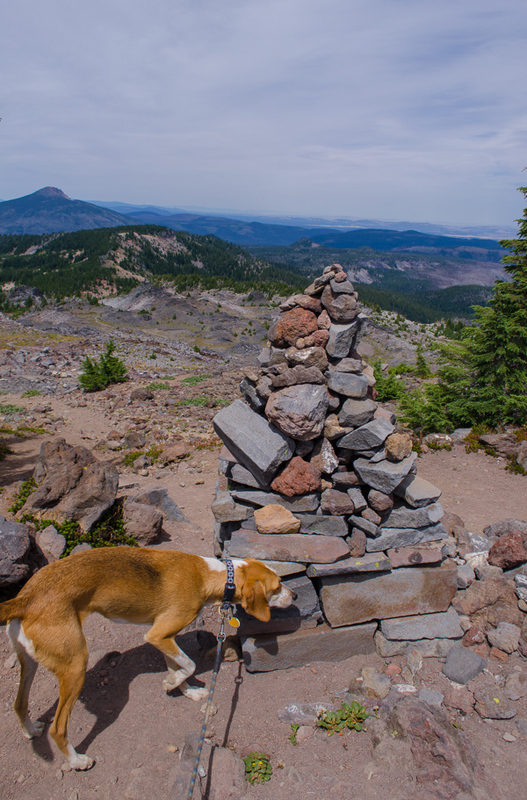 So, we picked our way up the rocky trail to Park Ridge, enjoying the views along the way. 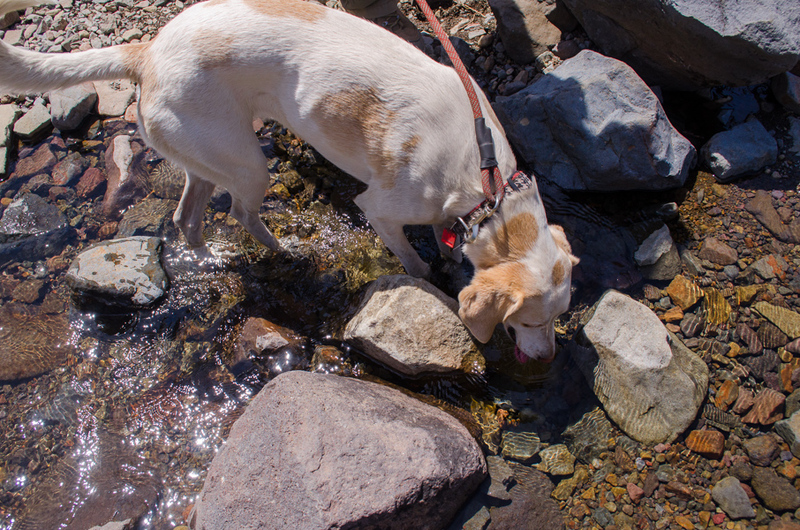 Annie and creeks go together like peanut butter and jelly. 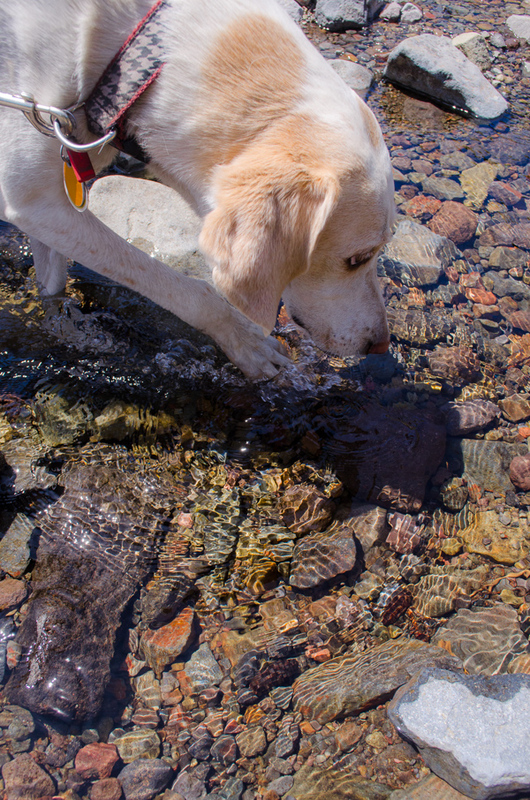 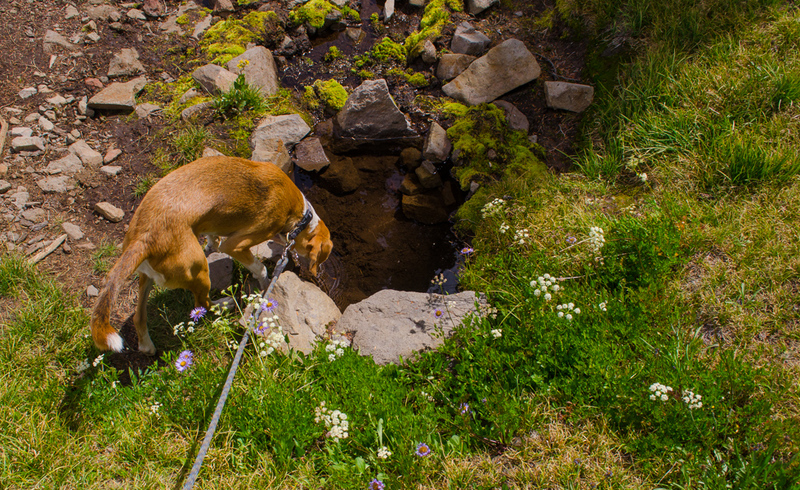 She loves them – anytime we come across one, she doesn’t hesitate: all four paws are in like a flash. 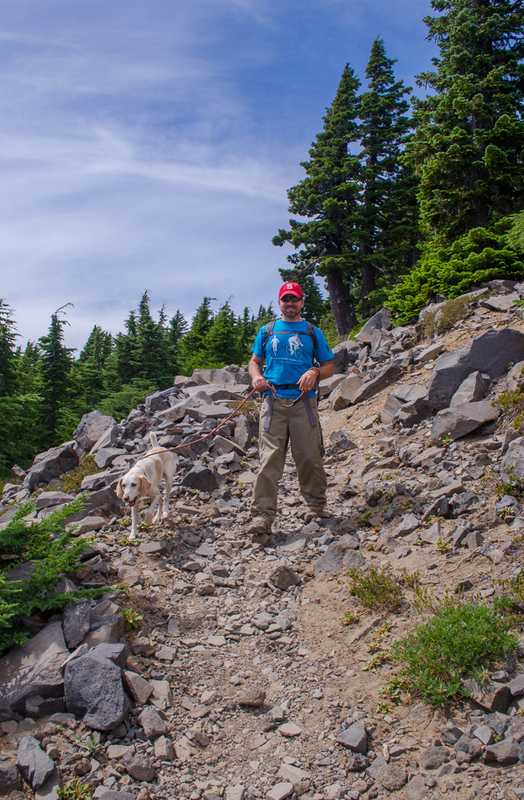 Along the way, we bumped into a fellow hiker who has hiked this trail many times. 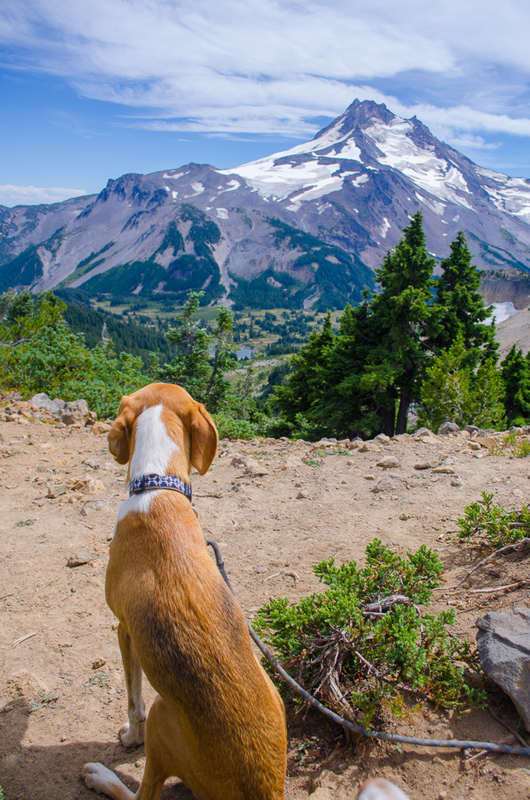 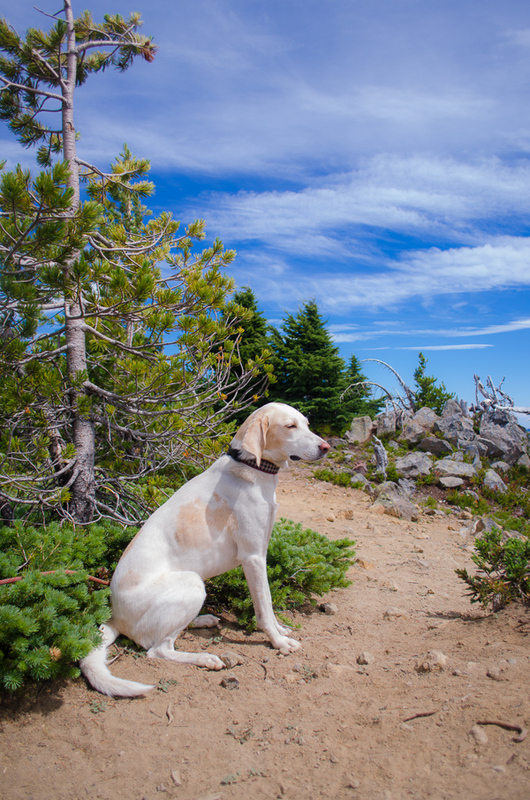 It was the first time he could ever remember not seeing snow on the trail in July. 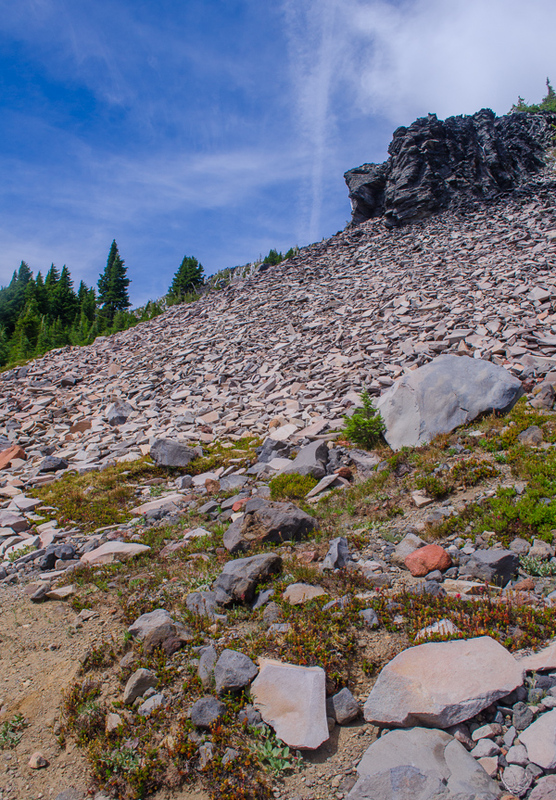 On the other side of the ridge, he had never seen the bare rock that was now exposed … previously it had always been covered in snow. 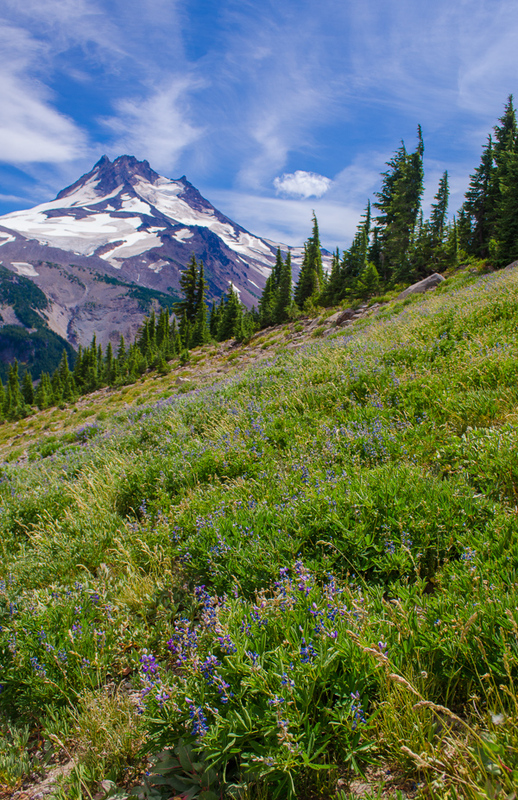 It’s most definitely a hot, hot summer this year. 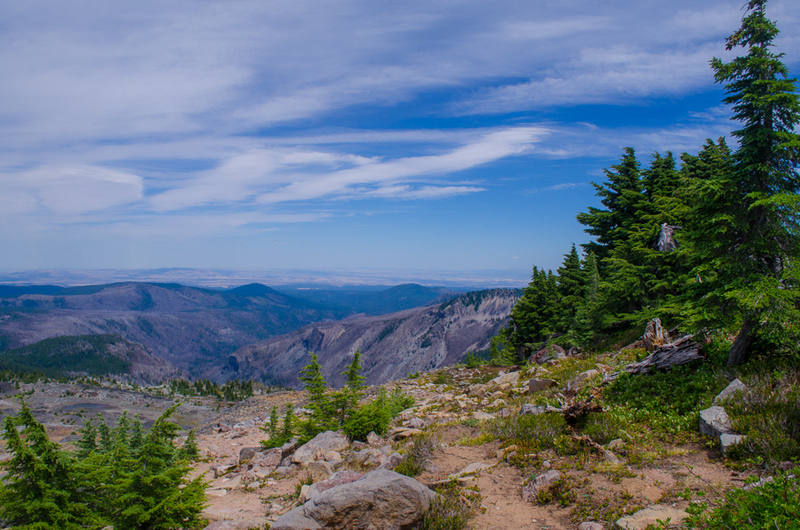 Once at the top, we found a sheltered spot to eat our hard-earned lunch. 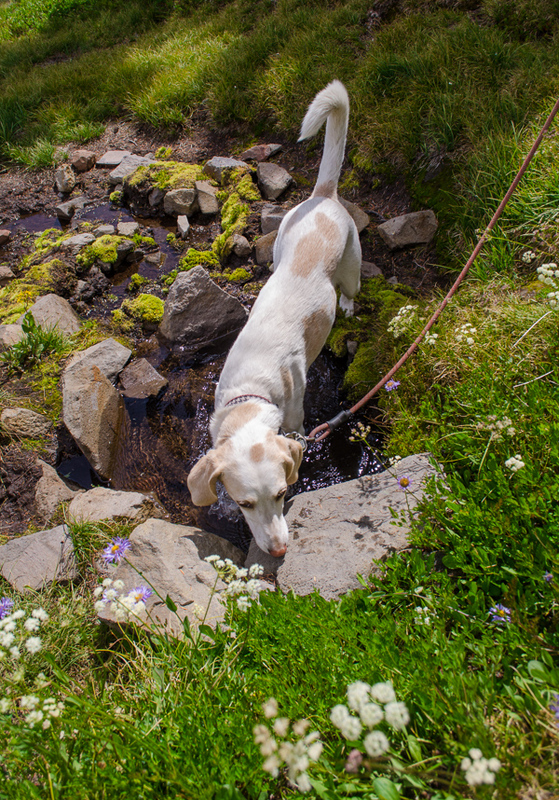 The dogs were more than happy to scarf down their extra meal (and some of ours 🙂 ). 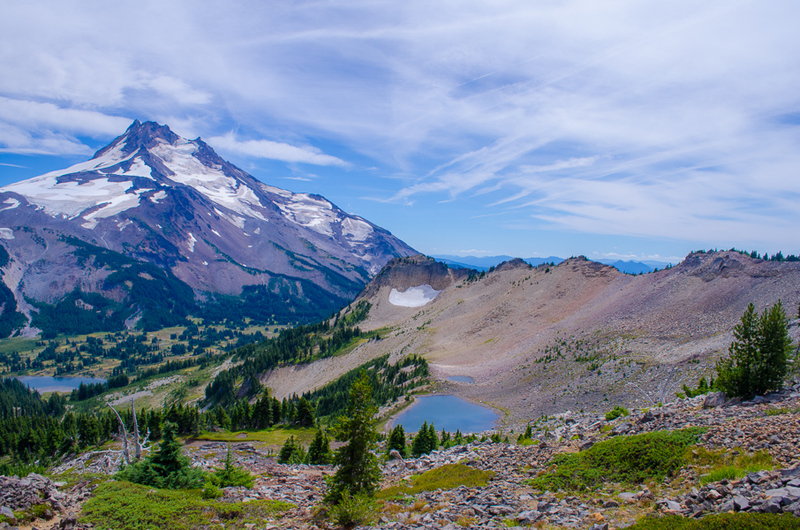 Then, we soaked in the view … and what a view it was. 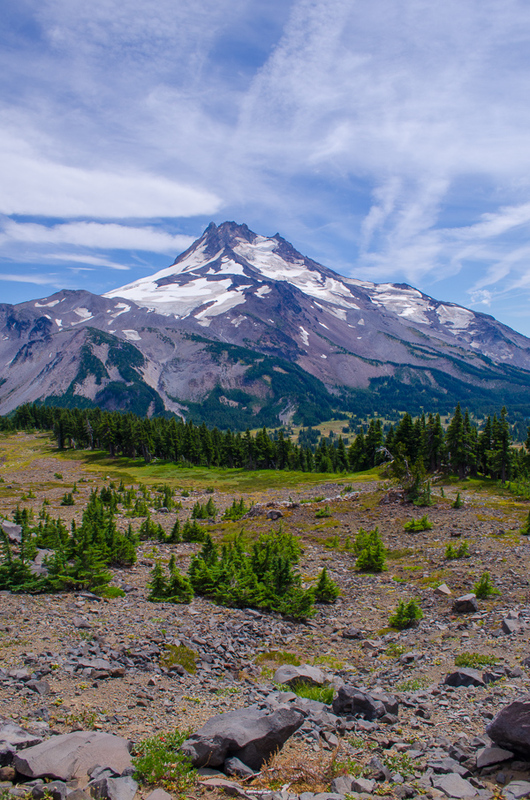 Mount Jefferson might as well have been a painting – it didn’t even look real. 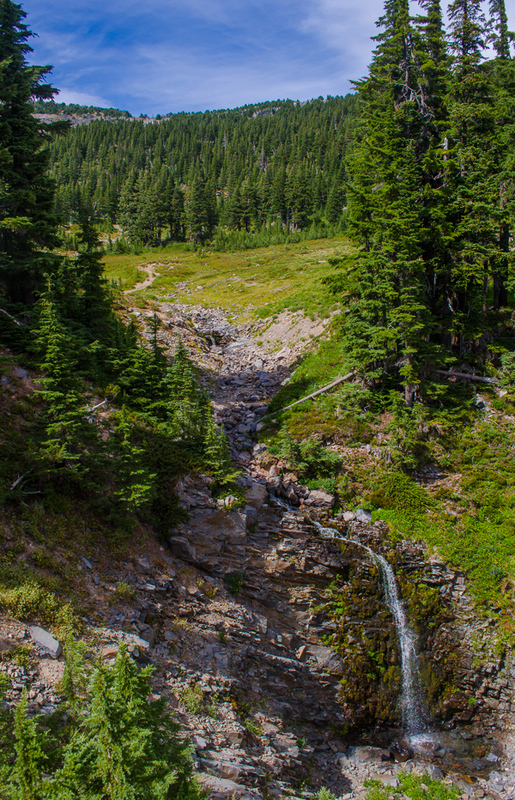 But I promise it very much was! 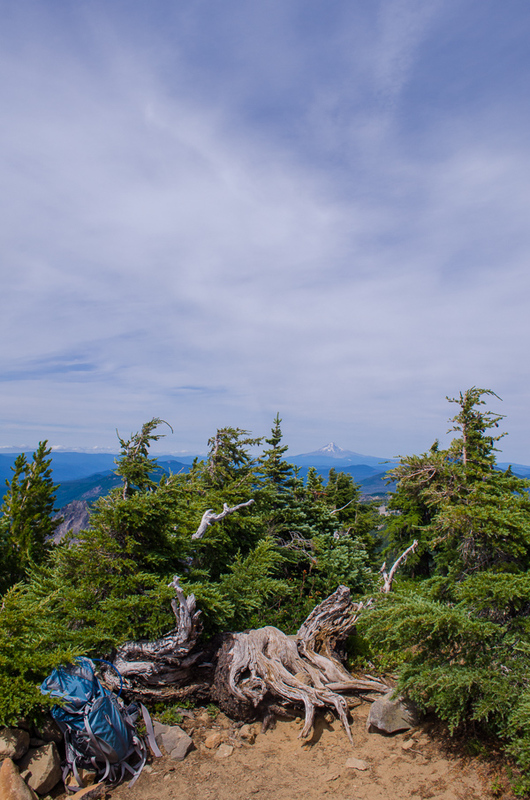 From our vantage point, we could see Mount Hood off in the distance as well as the complete lack of snow the other hiker mentioned. 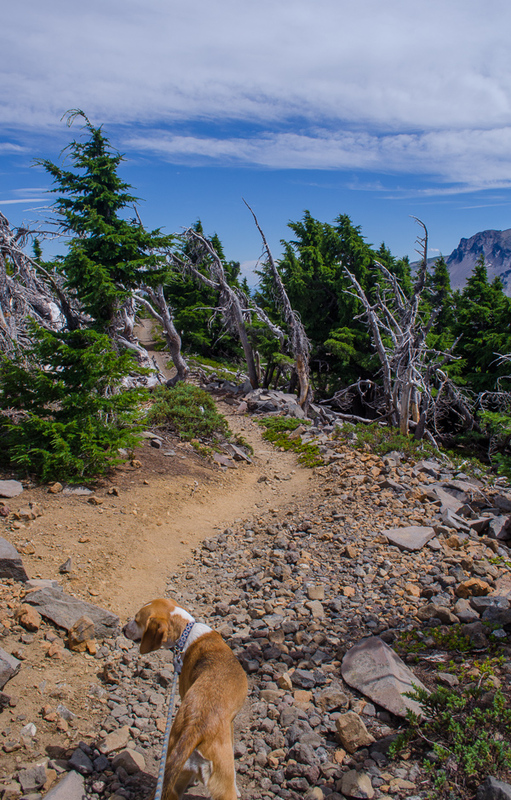 We finally tore ourselves away and headed back down the trail so we could explore the park up close. 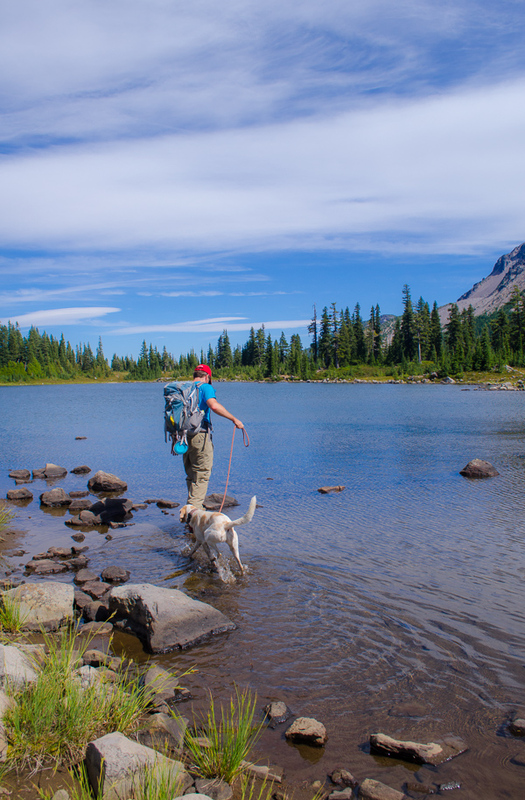 We checked out Russel Lake and Scout Lake, beautiful in their clarity. 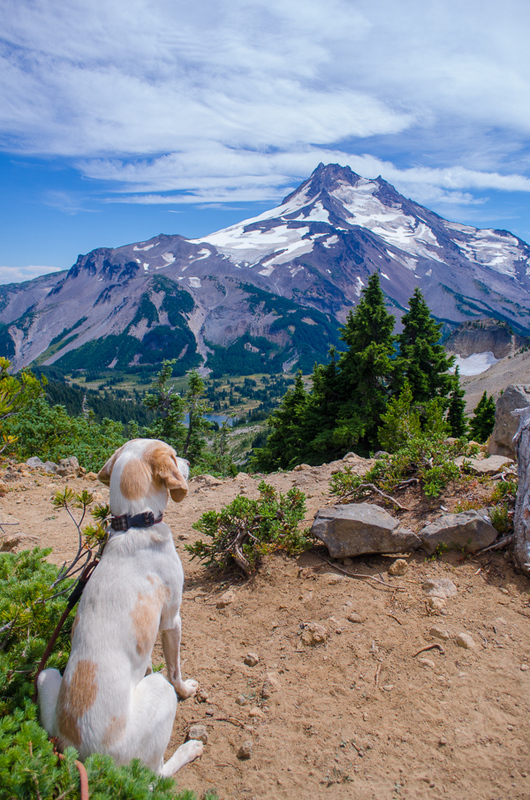 A long hike indeed but boy, what a payoff! 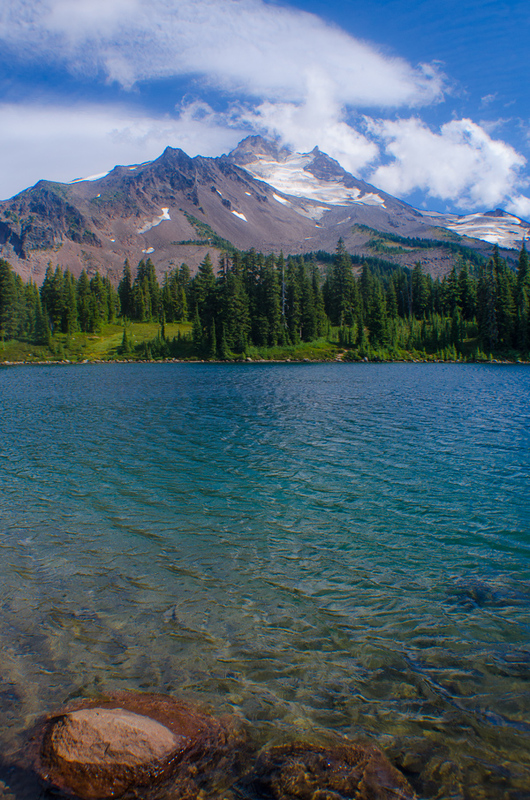 I can’t wait to go back and camp so we explore the park more in depth … so many little paths to follow and other lakes and other views … there’s always more to discover!